Within a sleek and elegant new design, the Ruckus ZoneFlex R710 access point supports up to four spatial streams and 500 concurrent clients. 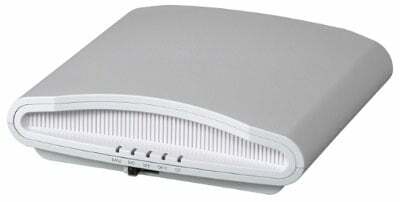 Additionally, each ZoneFlex R710 access point integrates Ruckus-patented BeamFlex + adaptive antenna technology, designed to enhance the operation of Wave 2 802.11ac technology by optimizing antenna coverage on a per client, per transmission basis. With four discrete, dual-band smart antenna arrays, the ZoneFlex R710 is capable of dynamically creating over 4,000 unique directional antenna patterns per radio, mitigating up to 15dB of RF interference while also reducing co-channel interference. Dual-polarized smart antennas also allow the R710 to automatically adapt to the changing physical orientation of mobile client devices such as smartphones and tablets, thereby helping to maximize uplink performance and offer unmatched reception of weak mobile client signals. With BeamFlex+, the ZoneFlex R710 also offers a significant increase in performance and range, delivering up to 5dB of signal gain and aggregate data rates of over two gigabits per second (Gbps), 1,733 Mbps (@ 5 GHz) and 800 Mbps (@ 2.4 GHz). Backwards compatible with existing Wi-Fi clients, the ZoneFlex R710 can operate as a standalone Wi-Fi access point or part of a centrally managed Ruckus Smart Wireless LAN (WLAN). Additionally, the ZoneFlex R710 is equipped with dual gigabit Ethernet ports that can be aggregated to satisfy peak throughput requirements for maximum investment protection. The ZoneFlex R710 is also unique in its ability to support spatial multiplexing, adaptive antenna switching and transmit beamforming—designed to ensure that Wi-Fi performance and reliability are never compromised. The ZoneFlex R710 maintains full 4×4:4 802.11ac functionality with standard 802.3af Power over Ethernet (PoE), eliminating the need for costly and cumbersome wired switch upgrades. The ZoneFlex R710 has a built-in USB port to accommodate Bluetooth Low Energy (BLE) beacons and other Internet of Things (IoT) devices. This, combined with Ruckus SPoT location-based services (LBS) and analytics, enable opportunities for enterprises and Service Providers to monetize their Wi-Fi investment in public venues through rich analytics and location-based user engagement.